First player passes to middle player, who looks to turn and play into opposite player. Each player follows their pass to rotate. The 10 reds keep possession, the 5 white defenders look to win the ball back. As soon as blues win possession, they can score in either goal. Looking for quick reactions of reds to stop white from getting a shot off or scoring, and red players to keep possession of the ball. After 2 minutes change the defenders. 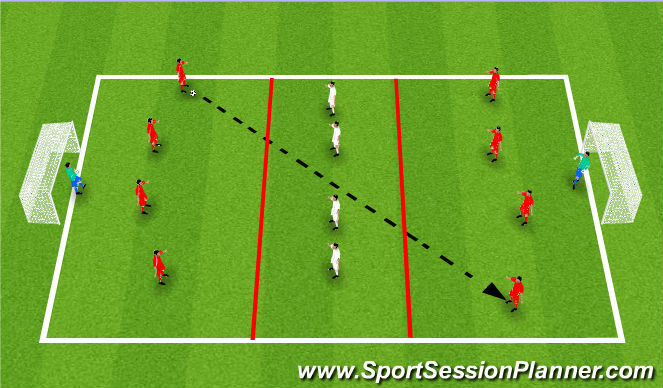 To allow a unit of players (defensive back 4) to practice being compact and sliding and screening to stop forward, penetrative passes. Playing area is divided into thirds, with a narrower central area. Four players in the defensive central zone. Three to five players in the end zones - including a GK in each goal. The red teams aim to pentrate the central zone by playing penetrative passes through the white team. Passes must be below head-height to begin with. 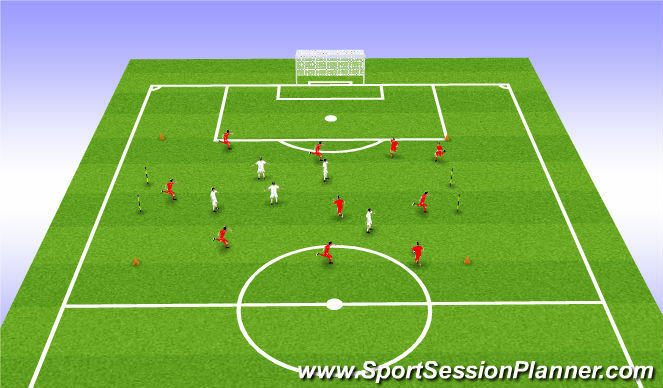 The central screening players remain compact and intercept as many passes through the central zone as possible. 1. When the white defenders intercept, they can attack the goal from the zone that the pass came from. Red team must then recover to defend the goal. If the white team score, they swap places with the team they have scored against. 3. Red team can now play long over the defenders&apos; heads. 4. One player from each of the two red teams acts as defender (3v1). Can the unit work together to discourage or intercept forward passes? Can they position themselves at angles and distances where a pass cannot be played through them? Can they work together to &apos;slide&apos; as one unit to cover the most dangerous areas? If a pass is played long and high, can the defender pressure and spoil the receivers touch and look to intercept? 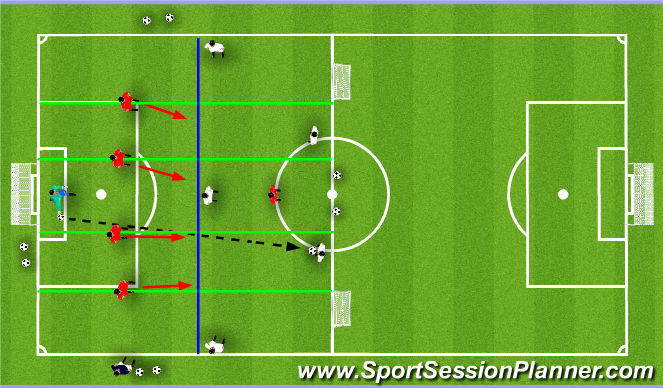 When one player is pressing, can he press intelligently, and not just chase after the ball 1 v 4? Can he isolate a player 1 v 1 or make play predictable for the defenders behind him? If it is inappropriate to press, can you maintain shape and force longer passes? 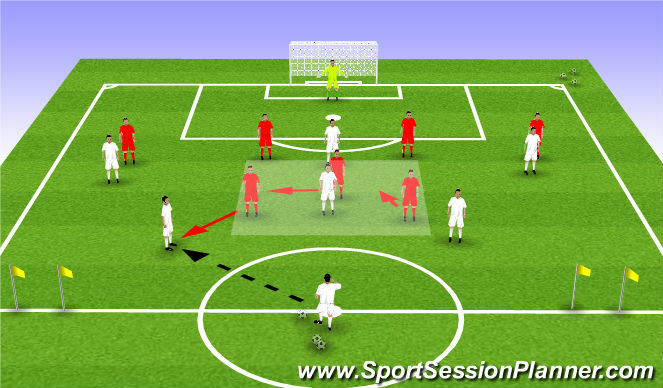 Once possession is won back, can the defenders counter attack and score in the opposite goal? Can they be clinical when doing so, and then recover to stop the next attack if they do not score? 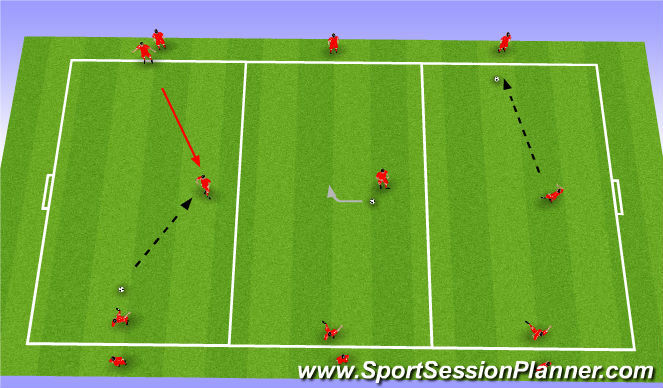 Ensure possession players use the width and depth of the area and qulaity of pass. The red team score by passing through the central area, but only half a point for passing over it. Defenders get a point for intercepting, and two if they score as a result of the interception. Working on back four defensive shape and organzation. Back four plays against a front 3. 2v1 in midfield. Attacking team try&apos;s to breakdown back four and score a goal. Back four win possession they attempt to pass the ball into either of the small goals. Recongnizing when to drop, when to step and when to hold the line. Allow serving player to join to create overload in the midfield - How do we solve the issue with comprising shape centrally?